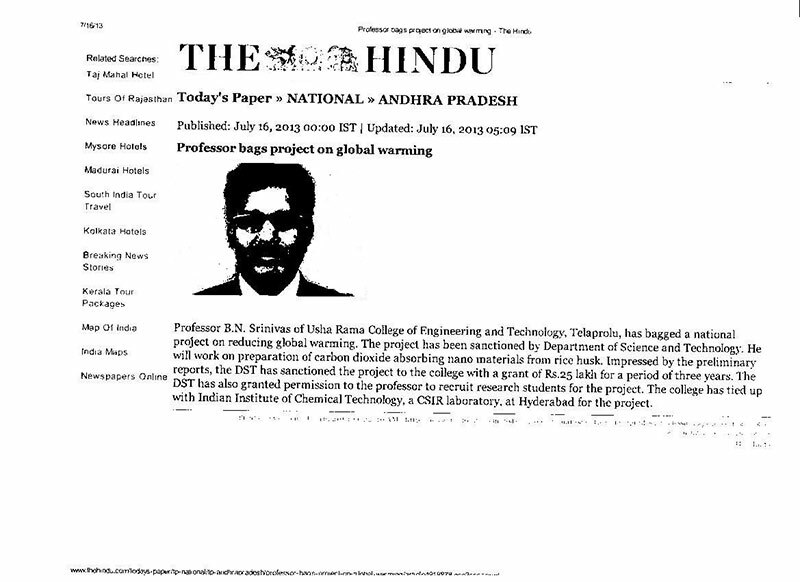 National project on reducing global warming has been sanctioned by Department of Science & Technology, New Delhi to Prof. B.N.Srinivas, Usha Rama College of Engg. & Tech., Telaprolu. This project is first of its kind bagged by any of Pvt. Engg. Colleges in Andhra Pradesh. Selection process was done in three stages. Many reputed institutions like IIT's, National research laboratories were participated in this selection process. Among them Usha Rama College and Indian Institute of Chemical Technology, Hyderabad are the only institutions got the prestigious projects from Andhra Pradesh. The summary of the project is preparation of carbon dioxide adsorbing nano materials from rice husk. Rice husk is a waste material, being used for burning bricks and for preparation of food materials in hotels etc. By this project, waste materials like rice husk is given added value. Global warming is increasing due to several factors like deforestation, industrialization, urbanization etc. All these factors are directly or indirectly connected to the liberation of carbon dioxide in to atmosphere due to which several changes are occurring in environment. These carbon dioxide adsorbents synthesized from rice husk will be place at flew gas pipes in industries where carbon dioxide will be adsorbed by them. 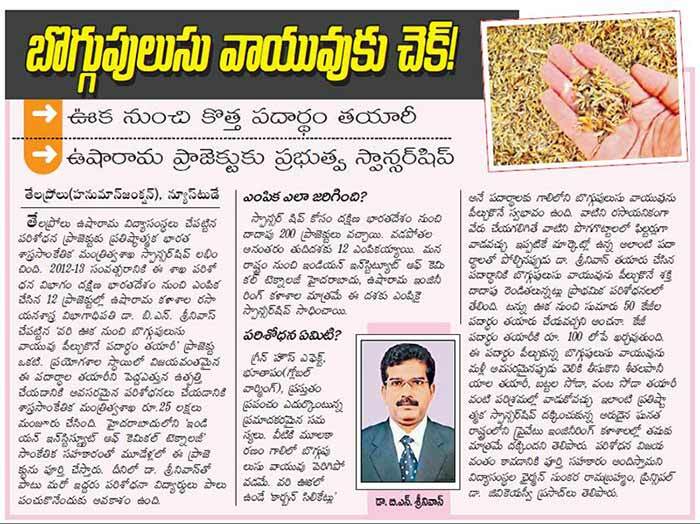 Till now this type of materials are developed from other sources but they have reported only 120 gr. of CO2 per kg of the adsorbing material synthesized. Dr. Srinivas has proved at bench mark level that these materials synthesized by their team is going to absorb around 200 gr. Of CO2 per kg of adsorbing material. The composite material prepared will be applied in increasing biogas efficiency by reducing CO2 content. The adsorbed CO2 gas can be recycled for preparation of certain laboratory chemicals like washing soda, baking soda and other bottling companies. DST committee got impressed with these preliminary reports and have sanctioned the project for 3 years and providing around Rs. 25 lakhs financial assistance. DST also granted permission to Dr. Srinivas to recruit research students for successful completeion of the project and for doctoral degrees. To complete this project Dr. Srinivas and Usha Rama college has collaborated with Indian Institute of Chemical Technology, Hyderabad, a CSIR laboratory with international reputation.